Personalised Halloween Bunting – Personalise your party this October by adding your choice of phrase or name to this spooky, Halloween bunting decoration. 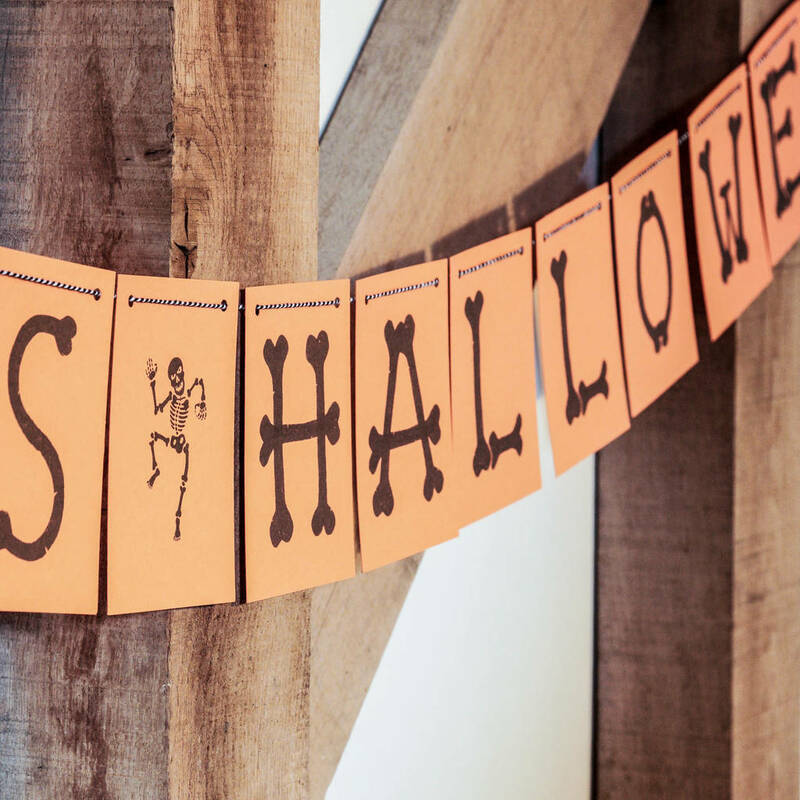 This boney personalised bunting decoration is a really easy way to decorate your house for Halloween. 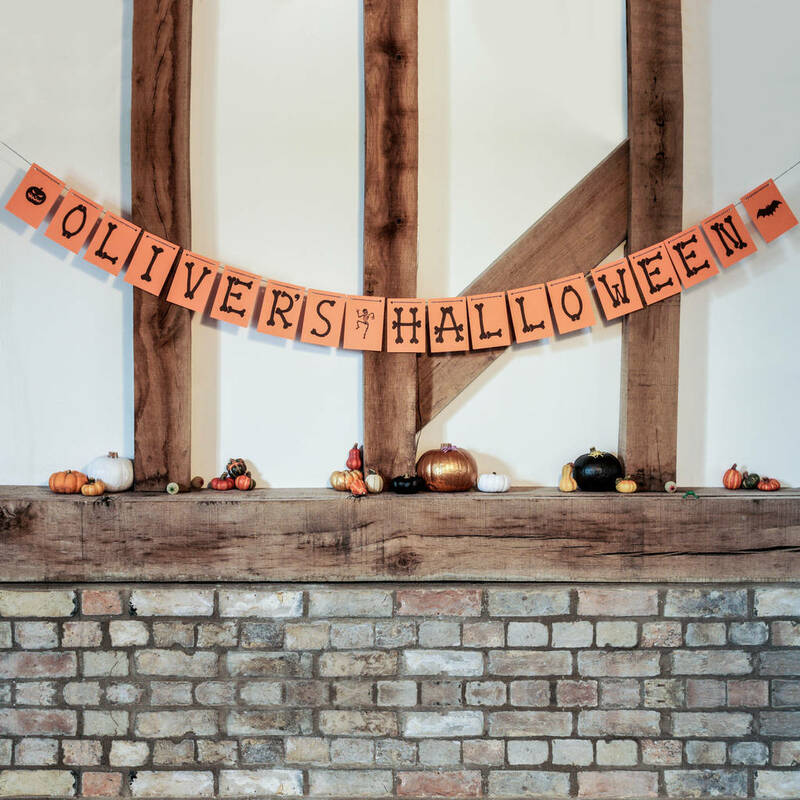 Our spooky alphabet has been hand-drawn before using traditional craft methods to individually print each letter onto high quality 350gsm card. Names are a popular choice for this personalised bunting, but it can say anything you like! For something a little different, you could choose a Halloween pun – maybe a “Creep it real” or even “I’m here for the boos” for a more grown-up party. Once you’ve chosen your message, you’ll need to count how many letter flags you need, decide how long you’d like your bunting to be and choose what colour string you’d like. You’ll also need to choose your spacer flags – you will need one for each end of the bunting and then one between each word (if you have three words, you’ll need four spacers). Spacer flag designs include black and orange illustrations of bats, pumpkins, cats, skulls, skeletons or witches. We think a mix and match looks good, but if you’re having a pumpkin party, you might want just pumpkin spacer, the choice is yours! As this product is made of card, it’s perfect for decorating indoors or outdoors if it’s not raining. It is not waterproof, and shouldn’t be used outside if it’s raining. Made from: High quality 350gsm card and either jute or cotton string. Dimensions: Each flag is A6 (105 mm x 148 mm) and you can choose your own finished length.